Ground support tower for audio systems. Ground support tripod winch lift for loudspeaker systems. Ground support for loudspeaker systems. Tall ground support tripod microphone stand with adjustable stem and boom. Studio, broadcast and live stage applications. 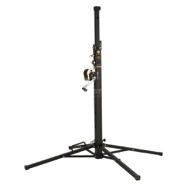 Ground support tripod stand for loudspeaker systems. 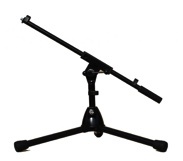 Short ground support tripod microphone stand with adjustable stem and boom. Studio, broadcast and live stage applications. Short ground support tripod microphone stand. Fixed length boom arm. Studio, broadcast and live stage applications. 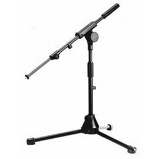 Short ground support heavy roundbase microphone stand with adjustable stem and boom arm. Studio, broadcast and live stage applications. 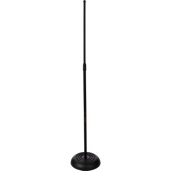 Tall ground support heavy roundbase microphone stand with adjustable stem. Studio, broadcast and live stage applications. Mini roundbase microphone stand with adjustable stem for banquting and conference applications. Ground support tower for audio and lighting systems. 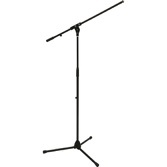 One handed microphone stand with adjustable stem. Studio, broadcast and live stage applications.